I love air plants, that they don’t need pots or messy soil. In nature they grow on the sides of trees in humid environments and feed off the moisture in the air. How hard can it be to keep them alive, right? This year’s bizarre gift idea was intended to be simple, but took two full weeks to make happen. Now that I know that traditional classroom chalkboards are magnetic, I wanted to make cute magnets for my favorite teacher. I bought decorated clothespins at the craft store along with a magnet roll. Easy, right? I snipped off about an inch of the magnet and it didn’t stick to any metal surfaces. And since it’s coiled, the adhesive didn’t adhere to the wooden pin, it just curled up. The would-be magnet went back to the store, as did another roll from a different store. Plants can be resilient. So can people. I have a talent for rescuing near-dead foliage. A few weeks ago my father was outraged that someone, probably local kids, broke off three branches from the coleus outside his home. I took the little wilted branches home, put them in water and watched as they formed roots and leaves. Yesterday I presented them to him as a potted plant, turning anger to abundance. And this is the second time in as many years that I have given coleus to his garden. The plants at work thrive in almost constant fluorescent light. I recently found a cutting dying in a wineglass. Here it is, living in a cheerful pot on a sunny windowsill. After a long day, it gives me a sense of peace to water the houseplants and marvel at their growth. Back from my unexpected WordPress hiatus with the realization that I can no longer do it all simultaneously. What a slap in the behind! During my mini break from content creation, I decided to try to embellish with paper tape. Yes, jumping on the bandwagon a little late, but I’m not one for bedazzling everything in sight. True to form, I bought two similar, subdued prints to decorate a metal frame, some battery-operated candles and a little plastic pot for my mini orchid. The verdict: paper tape adheres to paper, but not metal or plastic. Can’t get it out of my head: I have this crazy urge to make something. Something involving a glue gun or Mod Podge or dropcoths. I want to give it away, just for the fun of creating happiness in someone I love. One of my daughter’s Christmas presents was a gift basket of tree ornaments that I made. Total cost: about ten bucks. Her delight was immeasurable. That was four months ago and I still smile when I think of it. 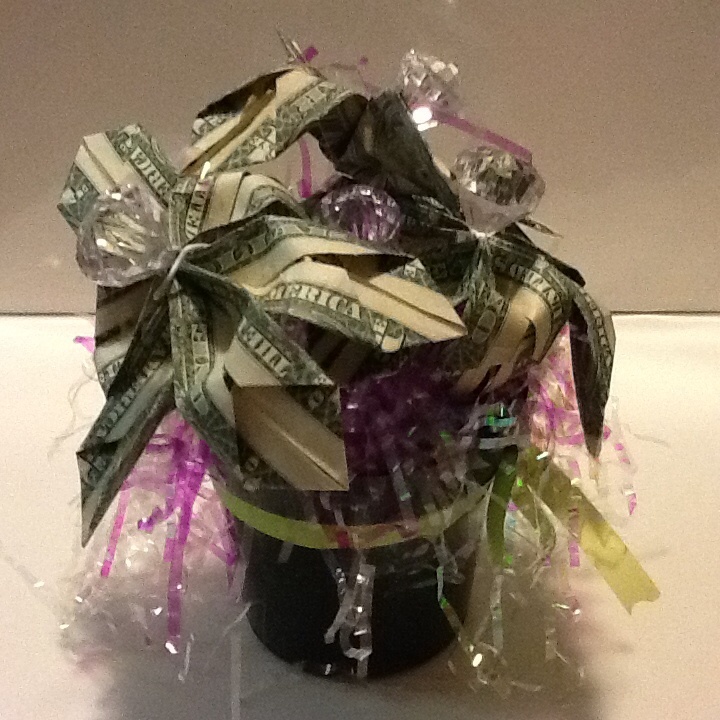 To top that, I thought I’d learn how to fold dollar bills into flowers and make her an Easter bouquet. There are instructions all over the Internet; I just need to devote a few hours to learning this. And that’s the problem: inspiration is everywhere. I want to make unique and beautiful stuff, but real-life responsibilities and real-life socializing get in the way. Last Fall I glued dried moss to a picture frame, hoping to make a spooky home for a Halloween picture. That stuff does not adhere, I now know. I was vacuuming stragglers for weeks and ended up just throwing the would-be frame away. Wise move, since there’s no room to store good ideas gone bad. Wouldn’t it be great to devote a whole room to creative endeavors? Unfortunately, that would be one underutilized space.